How is it possible to talk about the ravages of AIDS on the Black population of the United States without leaving oneself open to being viewed as racist, moralizing or simply communitarian? Barack Obama says he is determined to engage the United States in the fight against this worldwide plague but has a hard time talking about AIDS as an American evil and even less so as an African-American one. A question draws attention on the front page of the Wall Street Journal of August 1, 2008: Barack Obama, is he too thin to be president? The journalist wonders what we can think about a man who doesn’t eat junk food, (whatever he tries to have us believe) works out regularly and would likely be the thinnest president since President Lincoln. One can wonder about the capacity of the American people, of whom 66% are overweight and 32% obese, to identify with such a marginal phenotype. According to a researcher interviewed by the Wall Street Journal, people generally prefer a paunchy Bill Clinton unable to resist a hamburger in spite of his heart problems. Identification with the candidate is certainly a determining element in electoral alchemy. But if the silhouette of Barack is unusual, it is above all because it is that of an urban dweller who can do his shopping in the organic supermarket of the privileged, Whole Foods, run in the parks and pathways made for just this purpose and above all, has the financial means to take care of himself. Obama is a man in very good health and it is incontestably to his advantage in facing his opponent, he of a broken body and under the perpetual menace of a cancer relapse. But Obama’s athletic allure distinguishes him as fit, it is true, as opposed to the majority of Americans, less and less eligible for health insurance and therefore unable to afford adequate medical preventive care. His platform does indeed include the promise of protecting the least well-off Americans against the vagaries of their health, whatever their pre-existing medical conditions, either by the offer of public insurance or by a decrease in price of available insurance coverage. Although he refuses (distinctly from his former rival Hillary Clinton) to make medical coverage obligatory for everyone, his plan would benefit 23 million Americans, who have been uninsured so far . Indispensable without a doubt, this objective is far from capable of responding to the health worries that undermine the country today. Many Americans are poorly treated, as is now well known. But what is largely unknown is to what extent, in particular among those who expect the most from candidate Obama: African-Americans. The numbers showing the state of the health of Black Americans are regularly published. We are thus made aware, as of data from 2004, that the life expectancy of a white male is 76 years and only 70 years for a black male, that infant mortality is 5.7 per thousand for Whites and 13.2 per thousand for blacks and that, all diseases taken together, the mortality of Black Americans is 31% higher than that of Whites. The media and others in the culture industry have sublimated the daily presence of death in the poor areas of the country, particularly in African-American ghettos, between crack deals and gangsta rap. That Blacks die in violent crimes is a stereotype, and one that is not false; death by firearms ravages the population of young men from 15 to 35 years. But the evil that eats away at the Black community and does not make headlines is far from the commercial imagery of the ghetto. Its relevance was recalled by two recent reports, one by the Centers for Diseases Control (CDC) in March 2008 and another by the Black AIDS Institute  in July 2008, financed by the Ford Foundation and Elton John: 600,000 African-Americans are infected by the AIDS virus and 30,000 more are contaminated each year. That means that there are more people sick with AIDS in the United States than in Ethiopia, Haiti, Rwanda or Vietnam ! As stated in the New York Times, which reiterated the above reports: if Black America were a separate country, it would be classified as the 16th worldwide in terms of numbers of inhabitants living with the virus. Source : CDC, É. Laurent. One can read this last statistic as a double admission: on the one hand, of the great reluctance of Black Americans to admit to homosexual relationships and on the other, of the fragile status of women, infected by unfaithful partners. CNN, showed a remarkable documentary this summer by the journalist Soledad O’Brien entitled “Black America” in which she dedicated a substantial part of her investigation into the infection of Black women. In an emotional seesaw of cinema verité, the journalist accompanies a worried teenager to an HIV test center, where, after learning that she is not infected by the virus, she swears she’ll protect herself in the future. As incredible as it may seem, AIDS is the primary cause of death among Black women aged 25 to 35. To publicize the “naked truth” of the combat of a young woman contaminated by her “Prince Charming”, Marvelyn Brown published her autobiography in August 2008, entitled The Naked Truth-Young, Beautiful and (HIV) Positive . The young athlete from Tennessee was only 19 years old when her existence was rocked. Her story is commonplace, but as she became an activist, she spoke on the major African-American medias, from the Oprah Winfrey Show to Ebony and BET, addressing a public that does not like to hear about AIDS. Indeed, therein lies one part of the problem. The Black community is prisoner to a code of silence that compounds the already present ignorance of the modes of transmission of the disease—ignorance especially prevalent among poor and uneducated youth. Speaking about AIDS, which has struck them very hard, supposes breaking two cultural taboos. The first has to do with the existence of homosexuality among Blacks, a taboo maintained by churches as much as by popular culture . Ostracized homosexuals are condemned to live in total secret. In 2005, the rapper Kanye West explained on MTV that he had been raised to detest homosexuals but, having grown to see this as an error, he called for the elimination of homophobic insults in hip-hop. The road is still long before community leaders freely evoke AIDS and homophobia. It is only in recent years that church and community leaders, such as Al Sharpton, have spoken out in favor of public recognition of the problem. One also comes up against a second taboo. When Julian Bond, President of the NAACP, qualified AIDS as a black disease, or when the most active non-profit is called BlackAids, one seems to justify the long silence of notable African-Americans on the question. To recognize that a specifically Black “evil” exists could give American society an additional motive to stigmatize African Americans, who thus become identified, as during Katrina, with a Third World population. Above all, this would risk to further decrease public funding, as legislators could see the problem as community-specific, according to University of Chicago Professor, Cathy Cohen . It could, furthermore, sustain the idea that it is a pathology specific to Blacks, allowing culturalists to argue that their behavior is the cause and that the only prevention possible is an improved morality. This type of discussion by Conservatives, both Black and White, is not always presented as such a simple caricature  and Barack Obama approaches it with undeniable subtlety when he speaks of the importance of education for young Blacks. Still others fear seeing a resurgence of a desperate racial determinism, fed not long ago by the ambiguous debate around African-American genetic heritage,  stating that they were predisposed to diseases and therefore unaffected by social assistance policies. This silence was, however, broken more than 15 years ago. 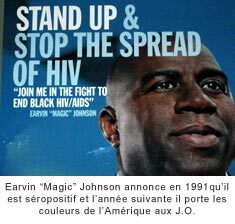 In November 1991, a legend of the Los Angeles Lakers basketball team, Magic Johnson, admitted being HIV-positive. With the tragic words, “Because of the virus that I contracted, I must today leave the Lakers”, the man who led his team to five consecutive titles, alter ego of Michael Jordan, became the spokesman for the fight against the disease. Black, national icon and god of the low-income urban neighborhoods, he didn’t lack courage, by his revelation then by his double combat against both AIDS and the reigning silence. Through his voice and his non-profit association, “Magic Johnson Foundation”, he does some remarkable work in order to fundraise, mobilize public opinion and lobby the public health services. Today at 47 years of age he owes his stable condition to a daily cocktail of Trizivir and Kaletra. This therapy is inaccessible to the majority of Blacks with the disease, whose number has tripled since Johnson’s announcement. One could endlessly discuss the degree of responsibility of the Blacks themselves in the awareness of the disease, however it is nonetheless a major public health issue that the American nation refuses to take into hand. In spite of numerous recommendations of the CDC and the experiments led by the United States in Africa and Asia, the government refuses to invest in a policy proposing sterilized syringes, the widespread use of information centers and the massive testing of at-risk populations (in particular in prisons  and pregnant women). Neither Medicare nor the Federal Health Plan reimburses testing. Private companies, by definition, do not insure the most exposed populations and doctors refuse to prescribe a test and an expensive treatment for patients unable to pay. Black AIDS underlines that if the fight against the virus in the rest of the world is a priority of the United States, it is only a second rate issue, knowingly neglected when it comes to its own black citizens . As is the case with any issue in his special relationship with the Black community, Barack Obama is in the delicate position in which neither indifference nor “racialization” of his campaign is allowed. Just a few days ago, a banner brandished in the middle of a crowd interrupted his speech, forcing him to respond to the demand inscribed on it: “Obama, what are you doing for Blacks?” The Democratic candidate treated the question of responsibility of African-American fathers in the education of their children with courage and, for several months, he has committed to the prevention of AIDS as one of the priorities of his mandate, as is evident in his plan to fight the disease, available on his site (http://www.barackobama.com/pdf/AIDSFactSheet.pdf ). Here one finds several recommendations of the CDC. On a visit to one of the low-income areas of Washington DC, he did not hide his concern. “One of every 20 inhabitants of the District of Columbia has AIDS: that is the highest rate of all cities of the country. Between 2001 and 2006, 80% of the new contaminations concerned Blacks. We must be determined to fight this global plague in our own community.” His program includes measures specifically destined for African Americans, but these appear, strangely, as a subsection of a global plan entitled “the global fight against AIDS”. AIDS in the United States was almost unmentioned in his national speeches and he belatedly excused himself for this in the magazine Essence, September 2008. When they visited Kenya last year, Barack and Michelle Obama showed no shyness when they were photographed at the Kisumu hospital having their blood taken, an image inviting Africans to get tested as well. When will they take the same initiative at the Chicago public hospital? Translated from French by Julie de Rouville. Sylvie Laurent, Homérique Amérique, Editions du Seuil, Paris, septembre 2008. Too Fit to Be President? Facing an Overweight Electorate, Barack Obama Might Find Low Body Fat a Drawback, by AMY CHOZICK, Wall Street Journal, August 1, 2008. U.S. Blacks, if a Nation, Would Rank High on AIDS, by Lawrence K. Altman, New York Times, July 30, 2008. AIDS and Black America, Boston Globe, September 4, 2006. Report urges measures to treat HIV in blacks, by Leslie Fulbright, San Francisco Chronicle, Wednesday, July 30, 2008. Amy Chozick, “Too Fit to Be President? Facing an Overweight Electorate”, August 1, 2008. See the regular articles by Thomas Friedman in the NYT. Though he not an Obama fan, he delivers clarifying analyses on health reform in the platform of the candidates. See for example “Mandates and Mudslinging”, The New York Times, November 30, 2007. New York Times, 30 July 2008. CDC report updated March 2008. See the articles of M.Eric Dyson on the Christian bases of Black homophobia in Reader. Michael Eric Dyson “Homotextualities: the Bible, sexual ethics and the theology of homoeroticism” in The Michael Eric Dyson Reader, Basic Civitas Books, 2004. Quoted in “AIDS and Black America”, Boston Globe, 4 September 2006. This debate between morality and the questioning of the social environment has animated the Black community since the 19th century. It was recently reignited by Bill Cosby’s recriminations of a Black Community that he judged irresponsible in many ways and above all by the virulent attacks of Jesse Jackson in July 2008 when Barack Obama invited Blacks to be good fathers. See R. Fryer, D. Cutler and E. Glaeser, “Racial Differences in Life Expectancy: The Impact of Salt, Slavery, and Selection.” Mimeo 2005. Darryl Fears “Study: Many Blacks Cite AIDS Conspiracy”, Washington Post, January 25, 2005. In the introduction one can read: “Black America, we have a problem. HIV/AIDS is running rampant through our communities. Many of us are sick and dying and living in fear and shame, and many of us who aren’t afflicted are living in denial, detachment, ignorant, and glass houses. Worse yet, too many people in our communities act as if they are immune to the problem altogether. ‘Not me.’ ‘Not in my family!’ And that’s the problem. Not in My Family is a weapon of warfare, a tool of empowerment, and a manual on friendship. It includes lessons before dying, lessons on living, lessons on love, and lessons on letting go. It is a collection of colored stories, hard truths, and differing opinions from people of various lifestyles strung together to teach us not only how to survive, but how to thrive in the face of HIV and AIDS. It is a dose of truth to our community. And hopefully, the truth will make us free.” Agate, 1st Edition, 2006. The infection rate of prisoners is five times higher than that of the population as a whole and there is no coherent policy for preventing the virus in prison. The report is entitled: “Left Behind! Black America: A Neglected Priority in the Global AIDS Epidemic”, cited by Leslie Fulbright, “AIDS in black Americans neglected” San Francisco Chronicle July 29, 2008. Gwen Ifill, “The Obamas: Portrait of an American Family”, Essence, September 2008.